As I am soon to discover first-hand, Australia is a very long way from North America. So when Adam Cogan makes the trip, he often extends his stay to see more people or places. Last September when we all gathered for //build/, Adam tacked a mini Canada tour onto his North American stay and we got together for a quick chat near my home. Part of it was filmed and (after a long delay to cope with the sound issues) is now available on the SSW TV site. It's just a 7 minute video, so give it a listen! Recently one of my staff went to a week-long conference - her first. 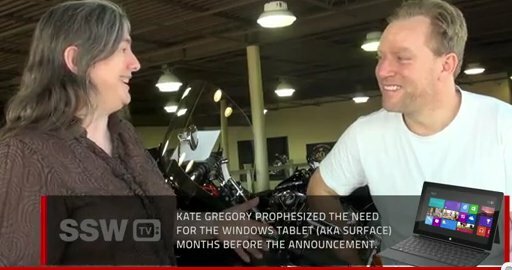 I gave her some tips before she went and it occurred to me that others might like them too. I hope you'll apply them to a trip to Tech Ed or some other conference where you can hear me speak. First, here are some links to some other good posts on the topic. Here's me a year ago, pointing to John Bristowe's suggestions for going to a big conference. And here's me 18 months ago, pointing to Joey deVilla's suggestions for meeting people and talking to them. And here's a great question (with an answer from me) on Programmers.StackExchange about networking at conferences. (BTW I met the asker of that question in person at Tech Ed, which was great for both of us.) And here's me four years ago with some details on choosing talks to attend. Plan your sessions in advance, at least two per timeslot. Carry a paper list of session names and room numbers so if you decide to bail on one, you know exactly where to run to, even if your electronics are out of battery and there's no wifi. Wear comfortable shoes and clothes, but not so comfortable that you would feel underdressed when talking to a potential employer or other business contacts. You will walk a LOT so choose those shoes with special care. It will be both stinking hot (outside - many conferences are held in hot places at muggy times) and freezing cold (if you end up right under the AC that is set on stun) so have a layering approach. Bring your own bag so you can tell it apart from everyone else's, and know just where to find things you need. Leave as much as you possibly can in the hotel room, to save your back during all that walking and to minimize what you might lose if there's any kind of bag mishap. Eat at the conference - it's a great time to meet people and this is where I usually bump into people I know. Pack a somewhat larger bag than you need to - there is a lot of swag at Tech Ed and first timers can't resist lining up for TShirts and the like. Don't be that person who stuffs it all in the conference bag and checks a second bag on the way home. For one thing, someone may accidentally pick up your conference bag thinking it is theirs. Your conference bag and all your other swag should fit in your main bag. Pack your days and evenings FULL. Don't you dare watch TV in your hotel room! Go to the labs and try something you always wanted to learn a little more about. Download something that was just released and try it. Go to a party. Write up your notes (or better yet, blog them.) Send your boss late night emails about what a great time you're having and how much you're learning. Watch one of the sessions you didn't get to that day and then figure out if the speaker is likely still at the conference and how you can arrange to find that speaker and say thanks for the talk or ask a question. Fill out the evals for the talks you went to. There is SO MUCH you can do while you're on site, so try very hard to do it all. Make the most of the week, make it intense, and you will get more out of it by fully engaging. Try to do at least a few hours of sightseeing - one afternoon or evening - with some friends if you can. Maybe the attendee party is being held in some iconic location? Go to that. Or there's a restaurant in the town that you've always wanted to eat at? Gather a few folks and arrange something. Twitter is great with the conference hashtag - "who wants to go to XYZ tonight?" - I've done this for going on tours too. Gives you fellow geeks to talk to while you sightsee and strengthens friendships if you go with people you only know professionally. But don't overdo the sightseeing - you're here for the conference, remember. I hope I see you there! The better prepared you are, the more benefit you will get from the conference! I've been putting my schedule together for the talks I want to attend at Tech Ed North America and Tech Ed Europe this year. While I wasn't looking, a bunch more C++ content was added. Plus some language agnostic sessions that chose to put C++ in their session descriptions, which is a new thing these days. (Europe doesn't have direct links to the sessions, but they do allow links to the search for C++.) I'll have to miss Steve's talk because Rong and I are going to Belgium, so that one I'll be watching online. One way or another, please attend or watch these sessions. There's a lot of new stuff happening! Some people really go above and beyond for community. They have an idea, and then they make it happen. Take Marc Gregoire, for example. Our names are similar, and we both care about community, C++, and related topics, but we've never met. That didn't stop him from emailing me to see if I would do a user group talk while I was nearby for Tech Ed Europe. Of course I would! And then he arranged for Rong Lu from the C++ team to come and do one as well. Marc has done all the work of getting the room, the travel arrangements, you name it. All I have to do is take a short scenic train ride, and talk about a topic I'm excited about. That part is easy. The organizing part is hard. It's going to be a very fun evening. I'm going to talk about C++ AMP, and Rong will cover what's new in VC++ 11. I've seen her speak before, and I know you're going to enjoy it. Be there, Wednesday June 27th at the Microsoft offices in Brussels. (I was kinda hoping for Tuesday, so I could make a joke, but Wednesday will be fine.) You need to register, so please do! 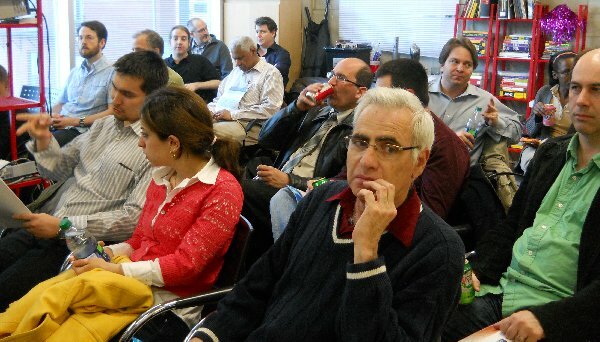 The next meeting will be shared with the North Toronto .NET User Group, covering Windows 8 development in native C++. Yes, the .NET folks want to hear about this, too! I'll see you there June 4th, right? I updated my C++ Windows 8 Development course for the Consumer Preview of Windows 8. There were a few breaking changes, so if you're working on a Windows 8 app, take a look through it. I'm part of a group working on a Windows 8 app in C++ and XAML called Hilo, inspired by the Windows 7 Hilo application. You can read more about it on Scott Densmore's blog, the Parallel Programming in Native Code blog, and the Codeplex site. There's another related blog entry, too. There are Windows 8 development camps going on all over the place, but most of them are in managed code. 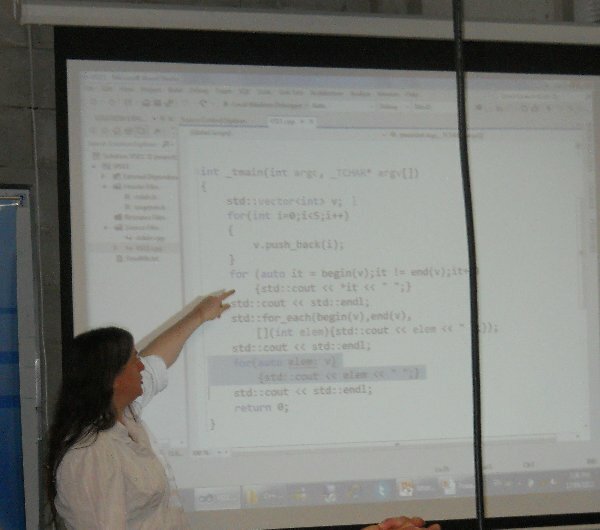 There's a native C++ one happening in Redmond on May 18th, and it's going to be live streamed. Don't forget my Advanced Topics in C++ course. I did an interview about it recently. Then there's C++ AMP - the topic of the book I'm spending all my time writing. They're hiring. This is a great opportunity for the right developer. 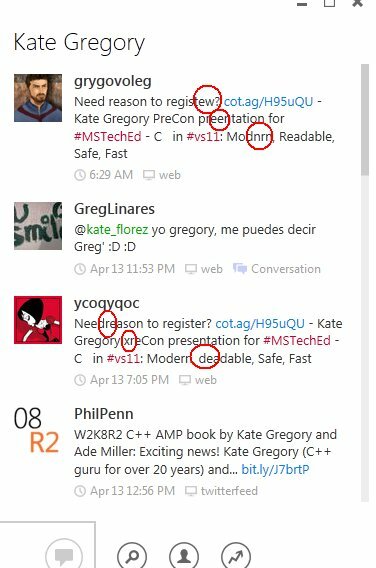 Oh, and James McNellis spent the last however-many-months answering the question "hey, if native WinRT has all this metadata about types, could you leverage that to implement reflection for native code?" Which for some people was a rhetorical question or interesting thing to muse about, but he went and did it. Incredibly cool. So there's something going on here, something spammy, but I don't see how they benefit. Is it to dilute an otherwise all-spam stream with some "useful" links? Should I report them to Twitter? If anyone knows, please clue me in. 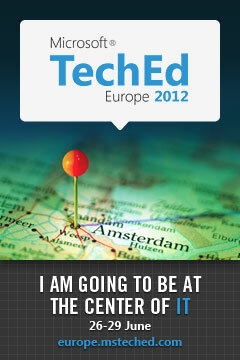 The times for my sessions at Tech Ed North America and Tech Ed Europe have been announced. PRC08 - C++ in Visual Studio 11: Modern, Readable, Safe, Fast is Sunday, June 10th in Orlando, 10am to 6pm. 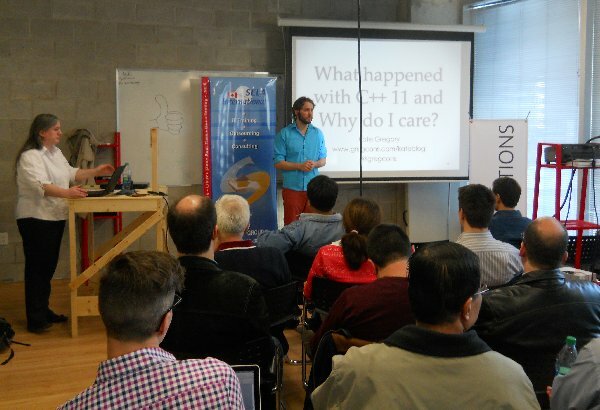 This is the session for those who've been ignoring C++ and are wondering why they keep hearing about it. Please encourage your friends to attend. DEV334 - C++ Accelerated Massive Parallelism in Visual C++ 11 is Tuesday, June 12th in Orlando, 10:15am - 11:30 am. This session will show you what C++ AMP is all about. DEV334 - C++ Accelerated Massive Parallelism in Visual C++ 11 is Friday , June 29th in Amsterdam, 1pm - 2:15 pm. Again, same material, different continent. Hope to see you in one place or the other!